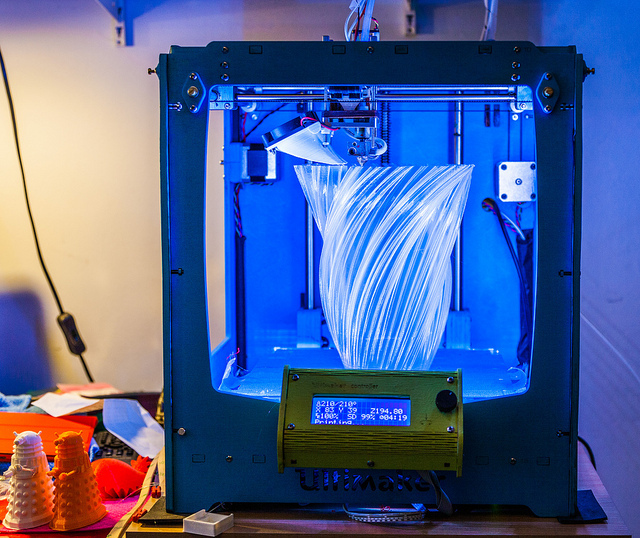 Network your 3D Printer with Windows 10 IoT Core. If only. I've installed Windows 10 Creator's Edition Fall Update. It's very nice. It has a lot of extra support for 3D printers. And I got all excited when I found out that there's an application for the Windows 10 IoT Core running on Raspberry Pi that lets you install your printer on the network and then print to it straight from Windows 10. It doesn't work. At least, not for me. I've spent all afternoon creating SD card images, configuring them and then finding out that I always get assigned the same (wrong) printer device and then the driver fails to load. One of the nice things about having a 3D printer is that it makes it really easy to iterate designs. I'm working on a new design for the configurable game controller. This version will have a socket for an input device and a bar-graph above each socket. I think I've found a design that sort of works, now to make up a panel. Oh, and one 3D printing top tip from Rob. Don't use oil on the sliding components. I thought this was a good plan, adding some "3 in 1" until the print head was moving really freely. What I'd forgotten though is that oil is sticky, and attracts dust. So when I fired up Una to print these prototypes she became very upset and pretty much locked up as all the sticky dust gummed everything up. Fortunately, after a good clean-up she's now working just fine. I've spent a chunk of the weekend printing Hull Pixelbot fridge magnets. I just took the logo and fed it into Cura (the slicing program that I use for Una, my 3D printer) and after a bit of fiddling I managed to get a 3D object that works quite well. Once printed I just have to rub a black marker pen over the 3D text to make the letters stand out. Although I wasn't as careful as I should have been, which has made them a bit smudged. Perhaps I can print a little mask to put over the text when I ink it. Anyhoo, the magnets will be going on sale soon in aid of Comic Relief. I'm doing a lecture in rhyme again this year all about robots, accompanied by a bunch of dancing Hull Pixelbots. Oh, and if you are in the university on Wednesday I'm also doing a Hull Pixelbot seminar thee too. I've just released a new set of design files for the HullPixelBot. I've made some improvements and also added holders for the pixel lights (always useful in a pixelbot) and the distance sensor. I was quite proud of the design for the distance sensor holder, until I tried to use it. I thought I'd been clever by providing mounting slots for the distance sensors so that the wires could come through the slots for the connections on the back. Turns out this was actually stupid. It turned out to be really hard to make the connections with the hole. The new design (which you can see above) has separate holes for the two sensor wires, and they are arranged vertically so you can just connect all the bottom wires together to a common ground (or reference voltage) and then take each of the top wires and connect them to their potential divider resistor and reference voltage (or ground). I'll be doing a detailed post about wiring things up a little later. 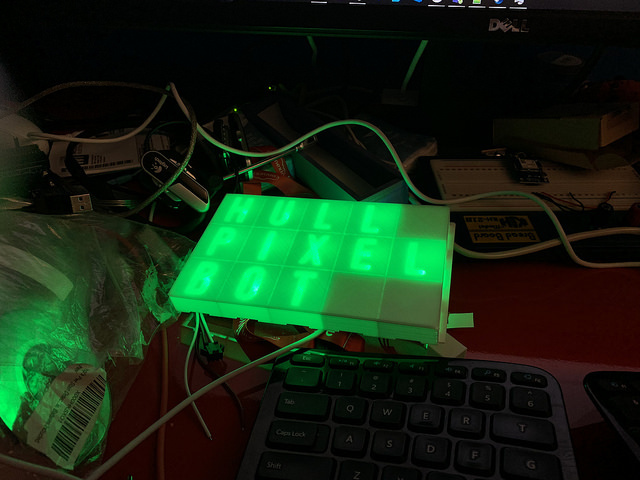 I spent a happy chunk of today designing and printing a front sensor assembly for the Hull PixelBot. The new part provides an ultrasonic distance measure and three light sensors. This will mean that the robot will be able to find and move towards light sources and also detect obstacles in its path. 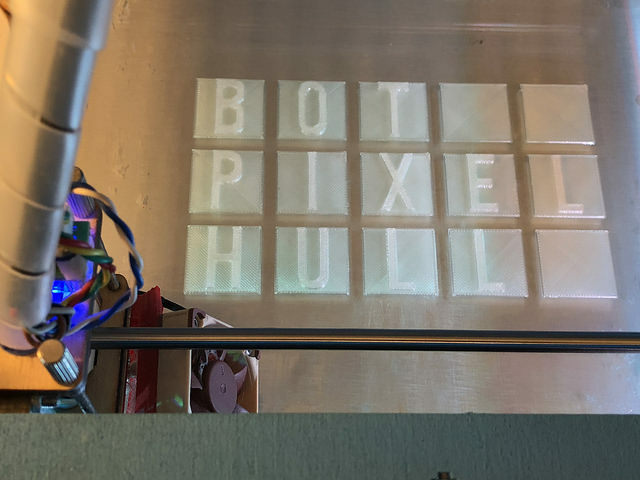 You can find out more about HullPixelBot at the next C4DI hardware meetup on Thursday 18th August. Sign up here (it's free). Anyone can come along and get into building tiny cheap robots. I'll have some more chassis kits to give away. All you need to do is add around 10 pounds worth of parts and you have a wandering pixel bot. And if you want to see a bunch of HullPixelBots in action I'm taking a mini-swarm to the Amy Johnson Festival Makerfest in Hull on 27th of August. I'm quite impressed by my Robot Drawing arm, but the pen mounting could be better. The problem is that the pen is held in place by a single bolt which doesn't stop it from wobbling when the arm changes direction. One of the great things about having a 3D printer is that I can solve these problems by designing and making a better one. You can see the design for mark 1 above. It has a thicker ring which will grip the pen over more of its length. I've got a plan to fit "rings" on the pens so that I can easily swap them in and out without having to worry about alignment. I'm also going to experiment with tiny magnets to see if I can use them to hold things in place. Such fun. For reasons I can't quite explain, I fancied making a large, red, network-enabled "Panic Button". The idea is that if anything bad happens on the internets the button will flash red and I can then press the button to restore peace and harmony to cyberspace. Or something. I'm going to pop a Photon device in there and then hook it up to If This Then That so that I can get it to signal simple messages. I've designed the box (curved corners and bevelled edges) and printed one out in yellow. I'm going to add some black tape to make it look properly panicky. Number one son reckoned I should have a go at printing the screw jack above, so I did. The intriguing thing about this design is that the entire object is printed as one, standing on its edge. There are some fairly prodigious unsupported elements in the design (you can see how the bar at the bottom left of the picture has some bowing at the bottom as it sagged during print) but to my amazement it printed mostly OK. The only major problem was that I broke the knob off the screw thread in the middle when I was trying to "un-stick" it from the elements around it. However, the designers have thought of this and provided the design file for just this component so you can re-print it. The jack does work; you can raise and lower it using the screw. I've not got a use for the jack as such (although it makes a fine support for the robot printing arm when I'm not using that). If you've got a few hours to spare and fancy a challenge I'd advise you to have a go. Great fun and amazing to think that such a complicated device was made as one thing. I don't know what you think Christmas is the season for, but I reckon it is 3D printing. Plenty of time at home to keep an eye on the printer, and maybe even useful things to print. This is a tape dispenser that I thought might be useful for wrapping presents. It works quite well, as long as you remember that the nut that holds on the roll of tape is screwed on with a left hand thread. If you forget this, as I did, you'll actually destroy your first print by trying really, really hard to "loosen" the nut. I got it to work but then I discovered this little gadget from Sellotape. You attach it to the knuckles of your left hand and you can just get tape as you wrap. It worked really well for me (I have slender and artistic hands - of course) although some of the reviews are less complimentary. Worth a look though I reckon.